Source of dig: Flight of the Conchords, more specifically episode 2's Pet Shop Boys tak eoff, "Inner City Pressure"
Runner-up: "Bret, You've Got It Going On"
Somewhere I have a list of favorite FOTC moments from season 1. I'll post it one of these days. McDonalds employee: Do you want a drink with that? McDonalds employee: [scrunches face] EWWWWWW!!! For your fries?!?!? I'm not really sure what to say at this point to stop her face from scrunching, so I just explain "it's the European way." She tossed the packets in the bag and handed the bag over like a dirty diaper. Uh...okay. I had plans to have a Simple Minds-themed entry a few weeks backs ("Simple Minds and the bands that sound like them" or something...). Here's an abbreviated version. One of my favorite song openings is the bassline that begins "Waterfront." Wore out my First (The Sound of Music) cassette, saw them live past their prime. Mark Shaw put lemons on his chest. 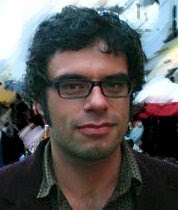 Jemaine has definitely got it going on. Excellent choice. I loved the multifaceted nature of his Bowie impression. Yeah, what was up with Eagle vs. Shark being so lame and stuff? Kudos for making a McDonalds employee's face scrunch. I've heard that's not an easy thing to do. It is indeed a sweet bassline. Waterfront era SM is my fave period of theirs. On the other hand, your So tale is quite harrowing. I've met so many people over the years who lived in Charleston (or on the coast of SC) and some of their tales are more harrowing than ours (especially the people who stayed).